I’ve been watching the steady march of 3D printing technology for well over a decade. In the early 2000s, 3D printers mainly existed in corporate labs and academic institutions. At the Australian National University’s School of Art – where I saw my first 3D printer in action – researcher Gilbert Riedelbauch was exploring this new technology from an artist’s perspective. I can still recall my amazement at watching a computer model come to life, layer by layer. In the years that followed, and driven by projects like the Reprap and Makerbot Cupcake, (extrusion-based) 3D printing has quickly become accessible to the individual. 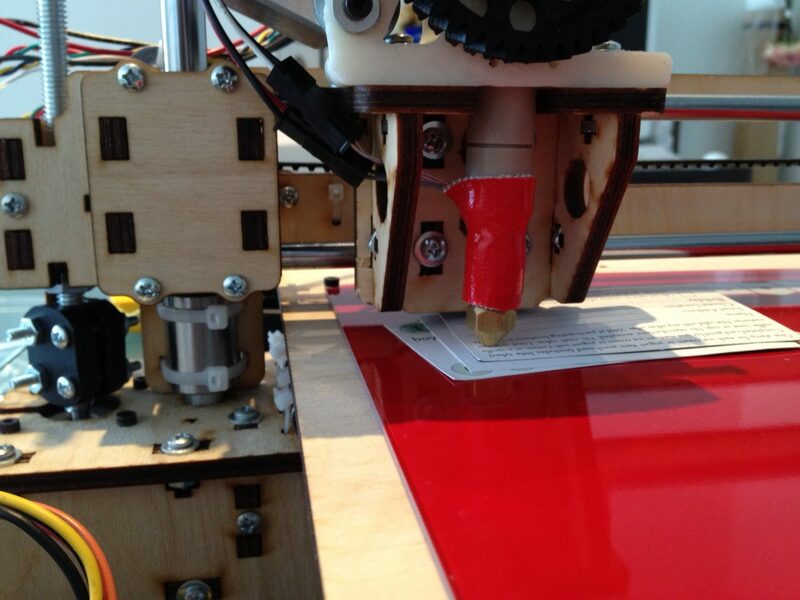 In 2011, I took the plunge and funded Brook Drumm’s Kickstarter for a new low-cost printer, the Printrbot. Touted as “an all-in-one 3D printer kit [that] can be assembled and printing in a couple of hours”, I was really excited about having this tool in my home. Adjusting the print bed to achieve the requisite spacing from the heated plastic extruder. The margin of error is literally the thickness of a sheet of paper. Fast forward to last summer and the PrintrBot+ package finally arrived in Vancouver. It took a couple of evenings for my kids and I to assemble the printer, install the requisite software and start melting plastic. And melt plastic we did 😉 . The margin between having molten ABS filament successfully deposit onto the growing plastic substrate and seeing it smeared over the tip of the heated extruder is literally the thickness of a sheet of a paper. We spent quite a few hours struggling with calibration and other setup issues, quickly discovering that 3D printing required a level of dedication at odds with my desire for a Star Trek “replicator”. You see, as much as I love technology, programming, electronics, etc., I wanted a tool to make things, not a new hobby. And while we did manage to print some simple objects, we never quite got to the “push a button” ideal that would allow us to treat the printer as a reliable tool. Last month I decided that our largely-idle printer deserved a new home. I made contact with the Vancouver Hack Space and, subject to the condition that it become a communal resource and not someone’s home printer, donated the Printrbot. 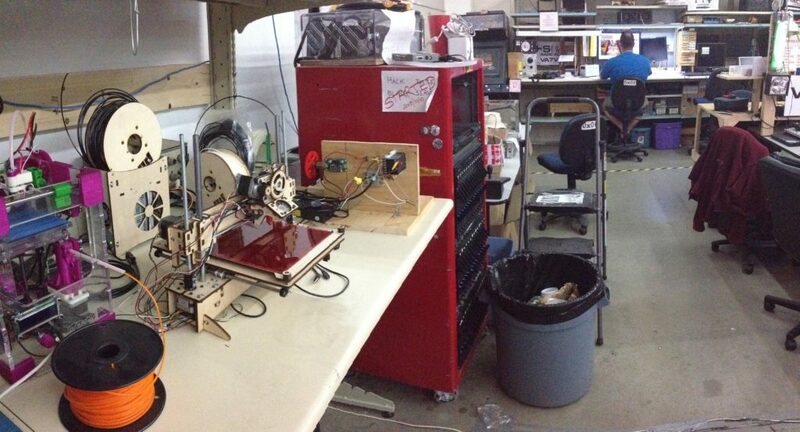 Our donated Printrbot installed and ready for use at the Vancouver Hack Space. Do I feel bad about this? Sure, a little bit. Not financially. Funding a Kickstarter should always be considered speculative, more a means of helping an individual or small company bootstrap production than a way of getting an advance version of a consumer-quality product. I think Brook has done a wonderful job in bringing 3D printing to a wider audience. I fully expect great things from his nascent company. And I certainly don’t mind contributing materially to Vancouver Hack Space – maker/hacker spaces are absolutely critical to spreading a better understanding of science and technology. My disappointment is that the future I want just hasn’t quite arrived yet. Or, as William Gibson said, it’s here, it’s just not evenly distributed.